What would be a Roman bathing pleasure without a proper massage? For additional relaxation we have a professional masseur for you who is state certified and independent in our premises. With the help of state-of-the-art HF technology, deep-seated fat cells can be dissolved. The device penetrates up to 3 cm deep under the skin. A frictionwill be created between the cells, these will burst and can be removed from the body by the lymphatic system. In this way, the size of the fat cells can be significantly reduced. the improvement of the absorption of vitamins and minerals. A powerful electrode transmits radio wave energy and creates an electric field that penetrates deeply through the surface of the skin and reduces wrinkles. The Colosseum offers an indoor pool. In this way the bad weather and stressful daily thoughts remain outside. The turquoise color of the water and the massage waterfall invite you to linger. Wonderful to relax and still in the middle of the action. Let your mind and soul dangle. This approximately 34 °C warm touch of luxury invites you to relax with comfortable reclining chairs for up to 6 people. It is pure relaxation. 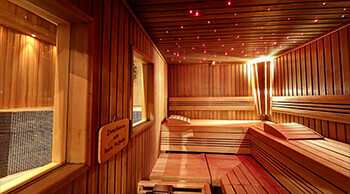 Continue your journey in traditional bathing culture and visit one of our three saunas. 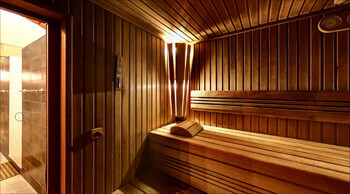 Sauna bathing is not just an old tradition, it refreshes and detoxifies. The “final kick” you get in our plunge pool. 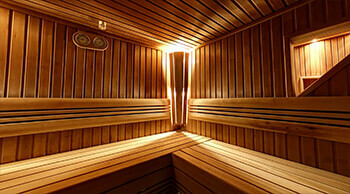 A must-have for every sauna fan.